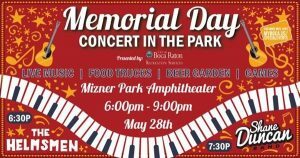 * Memorial Day Concert In the Park. Jeff Eats and Mrs. Jeff Eats got plans! Enjoy a concert in the park by The Helmsmen Band and The Shane Duncan Band, plus food trucks, including Tucker Duke’s and a beer garden featuring local breweries. Doors open at 5:30pm. Blankets and chairs are welcome at this free event, and chairs will also be available to rent for $5.00 (free for veterans). There is limited free parking for Veterans in the lot adjacent to the amphitheater. No coolers or outside alcoholic beverages permitted. The event is rain or shine. The weatherman just said big rain. The rain is going to wipe this event out.